For centuries, people have harnessed the power of the sun to stay warm and comfortable. Homes in China thousands of years ago had windows to allow sunlight in to heat the home during the winter. Greenhouses have been used to grow foods more effectively for hundreds of years. Solar energy is now freely available to everyone, and it’s a smart way to heat and cool air or water in an energy-efficient way. Solar water heaters are available today to anyone interested in heating their water supply with sunlight. These units feature a solar collector and a circulation system to catch sunlight, generate heat from it, and then redistribute that heat into water or another liquid. 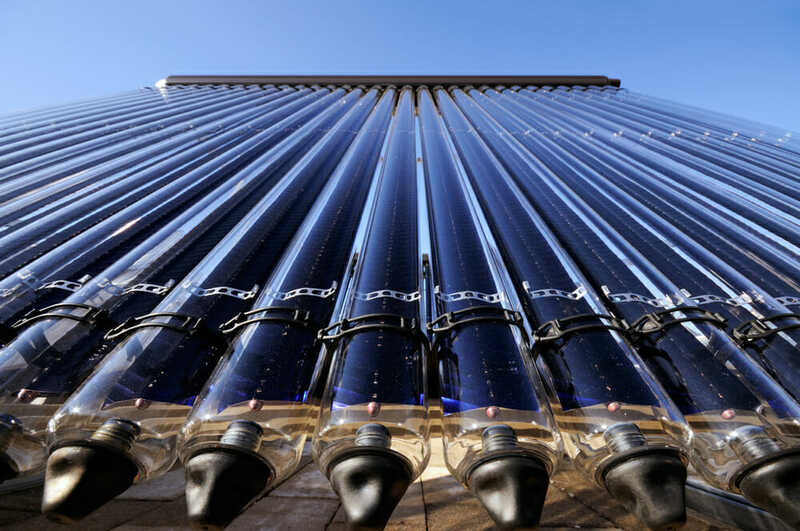 When choosing a solar water heater for your own use, it’s crucial to know what type of collector to use—the two most popular and widely debated options being flat plate collectors and evacuated tube collectors. Each is beneficial in its own way. Solar collectors are containers that heat when sunlight shines on them. They typically have pipes running through them so that water or another liquid can circulate and distribute heat. 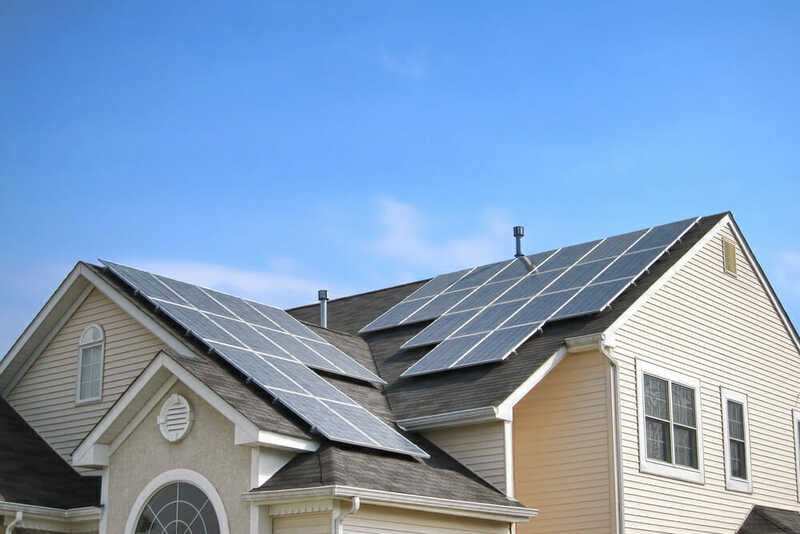 Solar collectors are designed to absorb sunlight and heat up. They pass that heat into a stream of liquid such as water or an antifreeze/water mixture. The heat from the collector is used to heat up water for showering and bathing, or to heat up a whole house through the use of radiators. A flat plate collector is a simply constructed basic solar water heater. It’s insulated at the back, then layered with a dark-colored heat absorbing material, then copper water tubes run over the heat absorber, and finally a layer of glass covers the top. The glass lets in light, and heat is absorbed from the light as it hits the absorber. That heat is then transferred to the water flowing through the pipes. The benefits of using flat plate collectors in your solar water heating system are undeniable. They’re often more affordable than evacuated tube collectors, they’re simpler, they have a lower profile, and they’re easier to maintain. One of the biggest perks of a flat plate collector is that it’s the more affordable option. Not only does it require less expensive materials than an evacuated tube collector, it’s also built using simpler construction techniques. These two benefits combine to make flat plate units cheaper than evacuated tube models. Costs between the two types are closer than they were in the past due to more cost-effective evacuated tube models that exist today. Flat plate collectors are made up of a single absorber sheet between a plate of glass and a sheet of insulation, with a set of pipes running through—and that’s pretty much it. Because of the simple construction of the units—much like a greenhouse or cold pane—they’re rather straightforward to disassemble and reassemble, or to repair, should the need ever arise. There’s a reason that the flat plate collector is called flat. A low profile is important if you’re trying to minimize the changes to your roofline, you want something that won’t catch the wind, or you simply have limited overhead space to work with. Most flat plate collectors are incredibly thin and, when set up on top of a roof, are less noticeable than evacuated tube models are. Flat plate collectors are built for durability, and they hold up in harsh conditions. They’re the type of unit you want to use if you’re worried about damage to your collectors, or if you simply don’t want to deal with maintenance issues very often. The units are self-contained, and they are protected by sturdy glass on the outside that resists scratching, denting, and breaking in harsh conditions. Flat plate collectors are subject to more heat loss than evacuated tube collectors because they aren’t insulated as well. This allows them to be more affordable and slimmer in profile, but it’s also the biggest downside of relying on one of these collectors. Under optimal sun conditions, you won’t notice much difference between flat plate performance and evacuated tube performance. However, during cloudy conditions the flat plate setup doesn’t perform nearly as well as the evacuated tube setup does. While flat plate collectors are slimmer in profile, they’re also wider, bulkier, and heavier overall than evacuated tube models. This is because they’re created from heavier materials and designed to cover a larger area. If you use a professional solar installer or have proper equipment to assist in hoisting them, then this isn’t an issue—but hand-lifting flat plate collectors is much more cumbersome than lighter evacuated tube arrays. Since evacuated tube models aren’t as efficient in cloudy or partly cloudy conditions, they also tend to lose heat a bit faster when it’s very cold outside. This makes them less suitable to cold climates where every bit of heat is precious. If used in warmer climates to heat water, they work wonderfully, but when heat really counts, evacuated tubes are more proficient. If you’re trying to cram as much heating power as you can onto your roof, you’ll get more with evacuated tubes than you will with flat plate collectors. That’s because the flat collectors are wider, while producing around the same level of heat (or less) than evacuated tube models. If roof space doesn’t matter, or you’re just getting a module or two, then this isn’t really an issue. Since flat plate collectors are wider than evacuated tube models—and therefore have more exposed surface area—this makes a real difference in windy areas. As air flows over the plates at steady speeds, they pull away some of the built-up heat that’s accumulated within the collector. If you live in an area that’s regularly windy, like the coast, you’d benefit more from evacuated tube collectors, since they’ll hold heat more efficiently in the wind. An evacuated tube collector is much more advanced than a flat plate solar collector. It starts off as an insulated water tank mounted horizontally with an inlet and outlet for water at either end. That tank is mounted up onto the upper rail of the frame, and a lower rail holds the bottom of the many evacuated tubes. There are between 10 and 30 small holes in the lower side of the water tank, and the top of each evacuated tube goes right up into the hole while the bottom slots into that lower rail. A metal coil runs along the inside of the water tank and pulls away the heat generated within the black evacuated tubes and heats up the surrounding water, making the whole system work. There are plenty of reasons to choose evacuated tube solar water heaters over flat plate collectors. They tend to be more efficient and withstand wind better, and they have a smaller footprint than flat plat collectors do. In a warm climate or location with full sunlight, the efficiency of an evacuated tube collector isn’t always obvious, but in cold, windy, or cloudy conditions, you’ll notice a very real difference in efficiency figures. Evacuated tubes hold heat better and they resist heat loss from moving air more effectively. In windy locations, the air moving over a collector can really make a difference to the internal temperature. Fortunately, an evacuated tube collector is insulated better and has a smaller external surface area that handles airflow better. This means if you live on the coast or on a big hill that gets plenty of wind, you’ll have better results from an evacuated tube collector. Evacuated tube collectors take up a smaller footprint when installed on top of a home than flat plat collectors do, which is helpful if you need to save space. An evacuated tube collector is more technologically advanced. It’s more intricately designed, relies on more parts, and is more difficult to manufacture. For all those reasons, the units are almost always more expensive—most by quite a bit. If you’re on a tight budget, you may not be able to afford to spend the extra money to buy an evacuated tube array, although it could save you money over time. There’s only so much weight a typical home can take. If you have a home with clay shingles, or some other heavy form of roofing, you might already be close to the maximum weight your home can stand. In this case, it could be dangerous to install an evacuated tube collector array because of the added weight of the unit. This shouldn’t be an issue for people with less heavy forms of roofing. Another downside to evacuated tube collectors is that they are much more fragile than flat plate collectors are. If a tree limb falls on your home, or if there’s a major storm with damaging weather conditions, the tubes are more likely to break than the flat plate is. This means you’ll be replacing equipment more regularly and you’ll probably have to pay someone to maintain your array, unless you’re going to do it yourself. The tubes are exposed to the elements and made from fragile materials that are easy to break. The plus side to this is that they’re easy to replace, even though they are a bit costly. 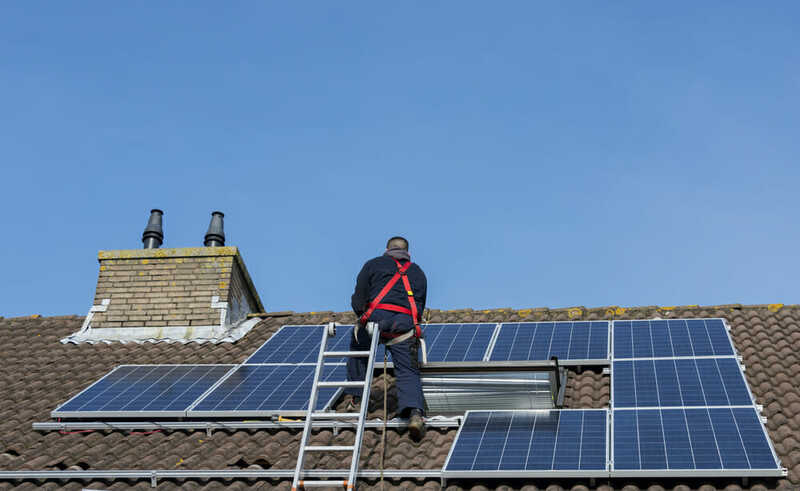 An evacuated tube solar collector is easier to lift up onto a rooftop because it’s split into more lightweight pieces than a flat plate model is, but it also takes longer to install for the very same reason. While the main cylinder and the frame go up very quickly, each of the exterior vacuum tubes has to be put into place and locked into position. Every tube adds about one minute to the installation process, which isn’t too much on a single 30 tube unit, but when many of these units are installed at a time, the installation time can really add up. In comparison, the flat plate unit is lifted into place as a single unit and locked down, and a single outlet and inlet water pipe is attached to complete the installation process. While both collector types are beneficial in their own ways, the one you choose for your home will depend on your climate, your budget, your needs, and your overall goals.